begin their day with hoppers, a crisp rice pancake enveloping an egg, string hoppers, which resemble rice vermicelli, Roti, made with flour and coconut sometimes added with chillies and onions to give a savoury taste, and many other varieties of native cuisine which are mostly eaten with fish or meat curry or vegetables. 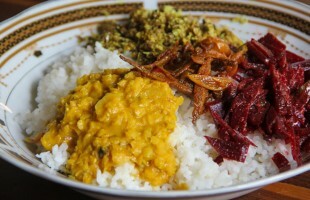 Main meals: Red rice and various curries are the main diet in Sri Lanka. 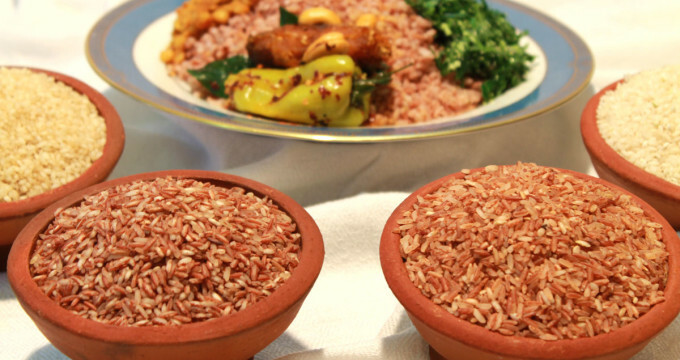 The rice served is always round grain and not the long grain that is used in other parts of the world. 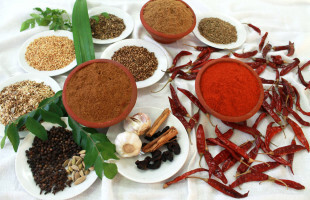 The curries are made hotter depending on the amount of ginger and chilli added and it is this nature that defines Sri Lankan cuisine from many others. It is possible to have upto severel different curries to accompany rice ranging from meat, sea food, poultry to vegetables and even fruit. Desserts:An adventure for the tastebuds when you sample some of the specialities which include curd & jaggery, tropical fruit salads, coconut cake, baked caramel custard, baked banana with honey and many more. The water from a freshly cut king coconut will envigorate and revive the tired body as well as the soul. Found almost everywhere this is an experiance you will not forget. On a more formal level Wine is not recommended if you are eating a curry as it spoils the taste of both the curry, and the wine. Local beers are excellent and tasty. Two of the local alcoholic drinks are toddy and arrack which are both made from natural ingredients. Whiskey is available in different strength. Tea is served with more milk than sugar. Soft drinks are available also. Fruit juices are common, but not always safe to drink & drinking water should be bought to be on the safe side.